Chinese Premier Wen Jiabao has said the current year will be the most difficult the country has faced this century because of the global economic crisis. Addressing parliament, Mr Wen reiterated that there would be a $585bn (£413bn) investment programme to stimulate the Chinese economy. He also declared an annual growth target of 8% and goals to boost consumption and raise consumer demand. 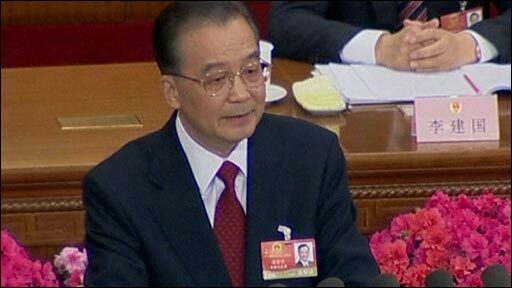 His address opens the annual session of the National People's Congress. The BBC's James Reynolds in Beijing says the Communist Party fears that if annual growth slips below 8% there will be social instability. When people cannot get jobs they start to question why the Communist Party should stay in power, our correspondent says, which is why it is so important for the Party to try to build on its stimulus package. The premier said he hoped to create nine million new jobs in the cities and increase local government spending budgets by almost 25%. "In China, a developing country with a population of 1.3 billion, maintaining a certain growth rate for the economy is essential for expanding employment for urban and rural residents, increasing people's incomes and ensuring social stability," he said. Mr Wen was frank that China was suffering from the global financial crisis, and acknowledged the country lacked adequate social security provisions and health care. As more people lose their jobs, the lack of a social safety net is becoming a glaring problem, our correspondent says. The increased spending talked about by Premier Wen in his keynote speech was announced last November. There appeared to be no new money to help the ailing economy, as some had speculated. Extra government money will be spent on infrastructure projects, such as railways, roads and irrigation schemes. Mr Wen said the government would work to maintain social cohesion, amid fears in Beijing that job losses for millions of migrant workers could spark unrest. "We will improve the early warning system for social stability to actively prevent and properly handle all types of mass incidents," he said. He also pledged greater efforts to tackle corruption, the source of widespread public discontent. But he said he was satisfied that China would cope with the unprecedented challenges. "We are fully confident that we will overcome difficulties and challenges, and we have the conditions and ability to do so," Mr Wen told the 3,000 delegates attending the Communist Party's showpiece political event of the year. On the eve of the meeting, which lasts nine days, China said it would increase military spending by 14.9% this year to 480.6bn yuan ($70.2bn).